November 20, 2007 - When you think of legendary guilds, what names come to mind? Band of Brothers, Illuminati, Serious Business? Your point of reference might be as broad as one of the sweeping Internet memes or as focused as the shard of the particular MMORPG you're playing, and it's likely that your criteria for judging a guild's greatness mirrors your own set of motives for playing these games. For gamers like me- who are far more interested in forging relationships with like-minded folks than claiming server firsts, who enjoy achieving, socializing, and exploring in equal parts - one guild that exemplifies greatness in size, stature, endurance, and values is The Syndicate. But what perhaps makes The Syndicate most special is that it's been in existence since before Ultima Online began alpha testing in 1996, continuing strong to this day across multiple games. The Legend of the Syndicate is guild founder Sean Stalzer's history of what he refers to as "online gaming's premier guild." History, however, is only part of the equation. If ever there was a recipe book for a long lasting guild tied not to any one game but to each other, this is it. You needn't read between the lines, either. Sean Stalzer provides a blow-by-blow account of the tried and true principles that help make a virtual organization thrive over the long haul. The book is as much a chronicle of the guild's culture as it is an explanation of its history. Stalzer places heavy emphasis on communication and comradery outside the game; through chat and the guild's forums of course, and also through the guild's annual live events (or "World Conferences"), starting in 2002. It was interesting to see how the guild's communication style evolved with the Internet, from email-only to forums to IRC, instant messaging, and voice-enabled technologies. This (and many other anecdotes presented by Stalzer throughout the book) was a journey many of us can relate to. Also enjoyable was the imaginative narration of several in-game events, such as the attack on player-killer stronghold in Ultima Online. Stalzer is at his best when bringing the game to life from the shifting, bird's eye perspective of a guild leader coordinating a large-scale event. While the more didactic parts of the book might come across as overwrought and preachy (and one description of the "ideal" fictional MMORPG , Cit-World, comes across more as an inside joke than a tension breaker), Stalzer's retelling of guild actions is pure enjoyment. Unfortunately, these storytime sessions get shorter as the guild spread into EverQuest and ultimately World of Warcraft, perhaps mirroring the imagination-sapping effect of third generation MMORPGs. To Stalzer's definite credit, the book neither comes across as a tool for self-aggrandizement or guild recruiting. The author makes it clear that recruits must fit the guild culture to stay on, and that this is not a guild solely focused on growth, accepting all types of gamers. If anything, the converse is true; Stalzer claims The Syndicate is successful because the guild's leadership stuck to its time-honored principles, letting the culture define the guild roster rather than vice-versa. Legend of the Syndicate is rife with these nuggets of organizational leadership and experiential wisdom. All in all, this is an enjoyable read for any seasoned fan of MMORPGs on game nostalgia alone, but. I'd go so far as to say that this is a book that should be on every guild leader's shelf. It won't take you an evening to filter through the 200-odd pages, but you'll likely distill some important answers and encouragement to deal with the many causes of drama in today's guilds. 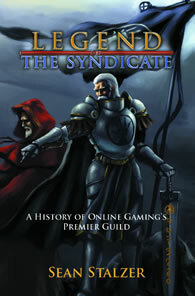 Legend of the Syndicate is destined to be a foundational work in the increasingly respected area of guild leadership. But pick up a copy if you just want an enjoyable trip down MMOG memory lane, too.